www.assaminfo.com - assam informations, assamese culture, tourist places in assam, education institutes in assam, festivals in assam, classifieds etc. 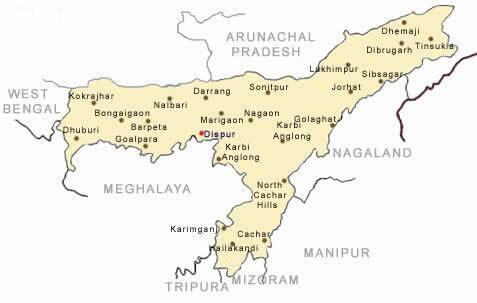 "ASSAM" is a northeastern state of India with its capital at Dispur. The name "Assam" is derived from the term "Asom" which, in Sanskrit, refers to unequal or unrivalled. The uneven topography of the land, full of hills, plains and rivers might, therefore, have contributed to her name. The Mongolian Ahom dynasty that had ruled Assam for more than six hundred years might also be the cause for her name. The academic consensus is that the name is associated with the Ahom kingdom (called Kingdom of Assam in medieval times), established by the Shan prince Sukaphaa in the 13th and which existed till 19th century for nearly 600 years. Except for a narrow corridor running through the foothills of the Himalayas that connects the state with West Bengal, Assam is almost entirely isolated from India. Located just below the eastern Himalayan foothills, it is surrounded by the other northeastern states: Arunachal Pradesh, Nagaland, Manipur, Mizoram, Tripura and Meghalaya. Its longitude lies at 88.250E to 96.00E and latitude at 24.50N to 28.00N and temperature varies from 60C TO 380C. Assam's economy is based on agriculture and oil. Assam produces a significant part of the total tea production of the world. 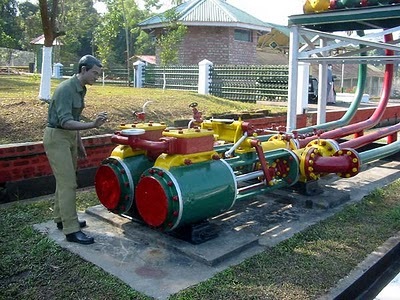 Assam produces more than half of India's petroleum. Assam was known as 'Kamarupa' or 'Pragjyotish' in the period of the Epics. Human inhabitation of this area dates backs to about 2000 BC. The population of Assam comprises of the migrants from Burma and China. They came into Assam after the mongoloid migration. They came from Punjab through Bihar and North Bengal. Thus Assam presents a fusion of Mongol-Aryan culture. The early history of Assam is believed to be of the Varman dynasty. The reign of this dynasty extended from 400 AD to 13th century. The visit of Huien Tsang is said to have taken place during the 7th century at the time of Kumar Bhaskar Varman. The Ahoms ventured into Assam in about 1228 AD. 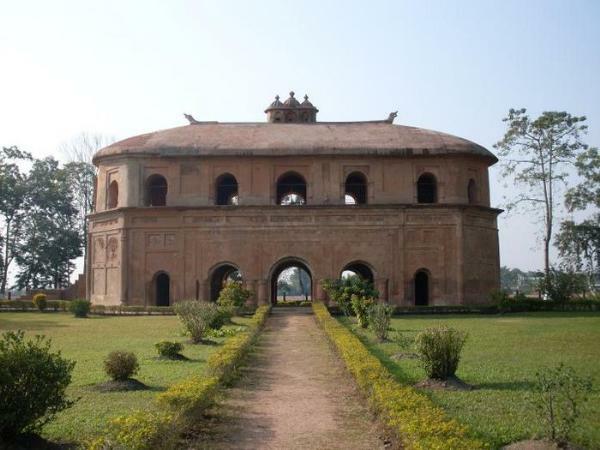 By 15th century the kingdoms of Ahom and Koch were established. This period witnessed a change in all walks of life in Assam. In the later part of the 18th century the Ahom Kingdom was weakened due to internal strife. The Burmese ran over the political authority in Assam thus invoking British intervention to subdue the Burmese. After a conflict between the Burmese and the English, peace was restored by the treaty of Yandaboo in 1826. The British then set out to organize the administration, transport and communication. Besides the various changes, the construction of railways; introduction of tea plantation, discovery of coal and oil etc. proved fruitful to the British during the World War II. After Independence of India, Assam witnessed several separation of territories. In 1948, NEFA (Arunachal Pradesh) was separated. In 1963 Nagaland was separated. In 1972 Meghalaya and in 1987 Mizoram. The humidity that is brought into Assam by the southwest monsoons, which shower an average annual rainfall of 120 inches or more on the great Brahmaputra valley and the surrounding region, also create spectacular sunsets during most of the year. The monsoons are Assam's life blood; creating a bio-diversity that can compete with the equatorial rain-forests and painting the region with a thousand shades of green. Assam, essentially, observes temperate climate. Its weather is characterized by heavy downpour and humidity. The hilly areas usually experience sub-alpine climatic condition, while excessive sultriness is observed in the plain lands of Assam. Though summer, winter and monsoons are the three seasons that visit the state, rainy season marks the most of the months of a year. Summers prevail for a few months between March and June. However, temperature never goes beyond 35º C - 38º C even in the summer months. Rain showers occur erratically and keep the temperature under control, nevertheless humidity levels shoot up. In the late-June, monsoon arrives with the oath to drench the state. Usually the intensity of rainfall crosses the extent and leads to natural catastrophes like floods. During the afternoons, thunderstorms are very common. Such heavy precipitation lasts till the month of September. Assam became a part of India after the British occupied the region following the First Anglo-Burmese War of 1824-1826. It is known for Assam tea, large and old petroleum resources, Assam silk and for its rich biodiversity. Assam has successfully conserved the one-horned Indian rhinoceros from near extinction, along with the tiger and numerous species of birds, and it provides one of the last wild habitats for the Asian elephant. 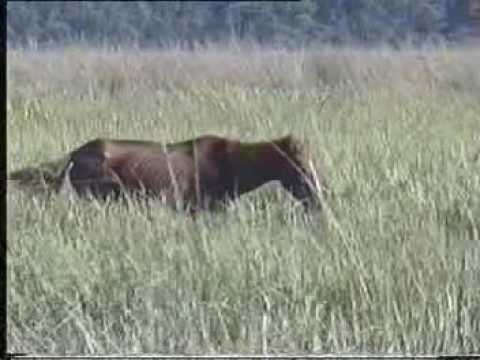 It is becoming an increasingly popular destination for wildlife tourism, and Kaziranga and Manas are both World Heritage Sites. Assam was also known for its Sal tree forests and forest products, much depleted now. 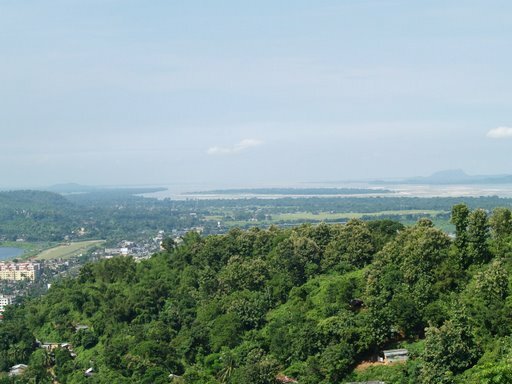 A land of high rainfall, Assam is endowed with lush greenery and the mighty river Brahmaputra, whose tributaries and oxbow lakes provide the region with a unique hydro-geomorphic and aesthetic environment. Geomorphic studies conclude that the Brahmaputra, the life-line of Assam is an antecedent river, older than the Himalayas. The river with steep gorges and rapids in Arunachal Pradesh entering Assam, becomes a braided river (at times 10 mi/16 km wide) and with tributaries, creates a flood plain (Brahmaputra Valley: 50-60 mi/80-100 km wide, 600 mi/1000 km long). The hills of Karbi Anglong, North Cachar and those in and close to Guwahati (also Khasi-Garo Hills) now eroded and dissected are originally parts of the South Indian Plateau system. In the south, the Barak originating in the Barail Range (Assam-Nagaland border), flows through the Cachar district with a 25-30 miles (40-50 km) wide valley and enters Bangladesh with the name Surma. Major Festivals : Bihu is the most awaited festival in the state of Assam. The major festival of Assam is Bihu, which is celebrated, in three different forms in three different times of the year, viz Bohag Bihu or Rongali Bihu in April, Magh Bihu or Bhogali Bihu in January and Kati Bihu or Kongali Bihu in the months of October/November. The festival of Baishagu is generally celebrated by the Bodo Kachadis during mid-April. It is in fact the most cherished festival of the Bodo tribe. The Bodo tribe celebrates this festival in the season of spring at the advent of the New Year. This festival is devoted to Lord Shiva or 'Bathou' as he is worshipped during this festival with utmost devotion and offerings of chicken and rice beer are made. Ambubachi Fair is the most important fair which is held held every year during monsoon (mid-June). This festival is held at the Kamakhya temple of Guwahati. It is a common belief that Kamakhya, or the mother Shakti goes through her annual cycle of menstruation during this period. During this fair, the doors of the temple remains closed for three days as it is believed that the earth becomes impure. During this time no farming work is undertaken and daily worship and other religious performances are suspended. 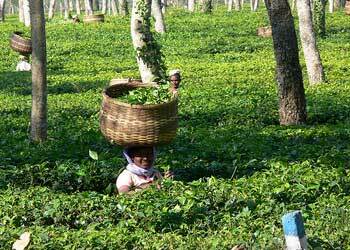 Tea Gardens : The state of Assam is the world's largest tea-growing region. Though "Assam" generally denotes the distinctive black teas from Assam, the region produces smaller quantities of green and white teas as well with their own distinctive characteristic. Assam Tea has made unmitigable mark on the hearts of people around the world. Just the scent of the freshly made Assam Tea will give you the most rejuvenating start of the day. Tea gardens of Assam are also a great place for tourists to enjoy the calmness and enchatments of Assam natural beauty. The plant was then discovered by Robert Bruce in 1823. After his death, his brother sent the seeds to British Government in Calcutta. They learned the method of tea production from china and employed it in Assam. They brought many workers from Bihar and Orissa who permanently settled here and came to be known as Assamese. For better results, local variety was crossed with Chinese tea plant to give rise to the present Assam tea. The Assam Valley area with over 600(Approx) tea estates. Taste Features - Rich, strong and full-bodied with a distinctive malty taste. Serving Suggestions - Best served with milk. The ideal breakfast tea. The quality of Assam tea is excellent. Assam, as with Darjeeling, has a first flush and a second flush tea. The first flush has a rich and refreshing aroma; the second flush produces the famous "tippy teas." 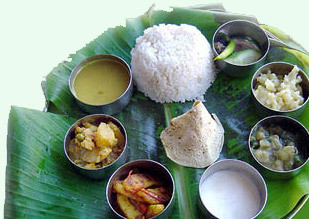 Assamese Cuisine : Assamese eat non-spicy foods and even bland at times. The staple food of Assam is rice, which is consumed in a variety of ways. Whether taken as steamed rice, poita (cooked rice soaked overnight) garnished with mustard oil and onions or Komal Saul (soaked with milk), rice is used in the everyday meal of the native people. During special occasions like Bihu, a special type of rice preparation called Pithas is made. The different varieties of Pithas include Ghila pitha, Til pitha, Sunga pitha, Tekeli pitha, Bhapotdiya pitha, Tora pitha, Kholasapori pitha & Xutuli pitha. Traditional Assamese food is cooked in earthenware on a wood fire, giving it its unique flavor. Assamese cuisine is a mixture of different indigenous as well as external influences with a lot of regional variations. It is characterized by the use of simple ingredients which are at times very flavorful and at times very pungent. Fermented food is very widely used, giving it a very distinct flavor. Preparations in Assam are rarely elaborate. People of Assam eat non-spicy foods and even bland at times. Rice is the staple diet and other supplementary food includes lentils, fish curry, meat curry along with herbs and vegetables. The curry is generally seasoned with ginger, garlic, cardamom, cinnamon, onions and sometimes lemon.